Click on Photos to Enlarge Two fairies, Brenda MacDonald and Bobbi Carson, will be seen in the big Santa Claus parade in Midland Saturday afternoon. 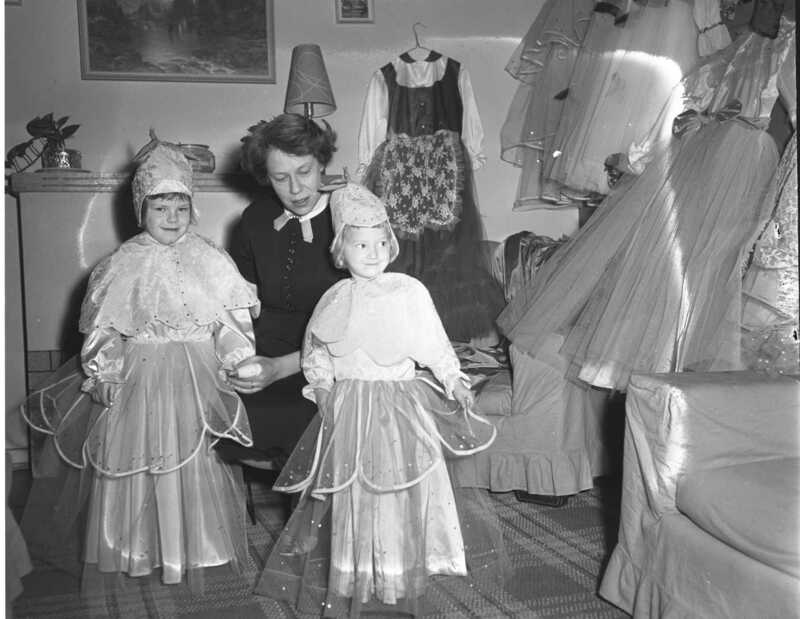 With them is Mrs. Ed MacDonald, who does the sewing of the dresses after they have been designed by Mrs. Bob Carson. The ladies already have orders for over fifty costumes for the parade being sponsored by the business men’s committee of the Midland Chamber of Commerce. 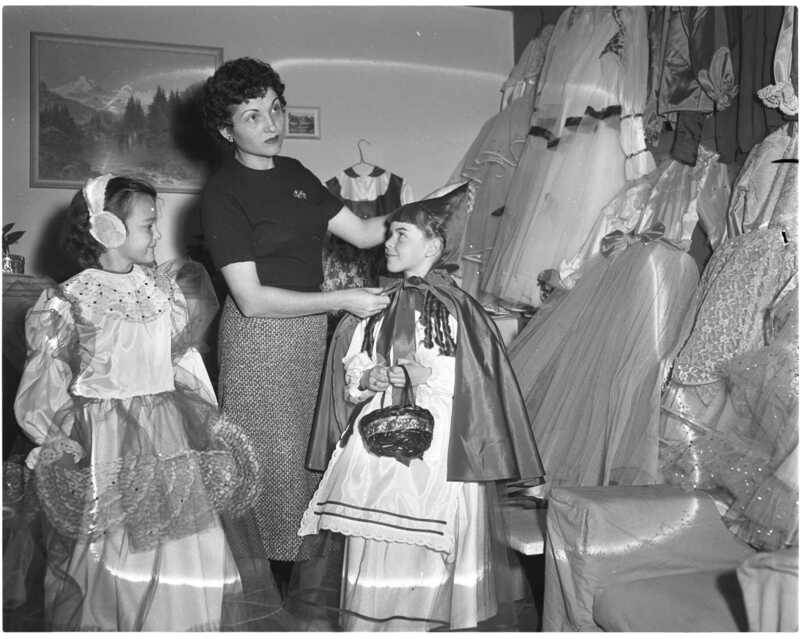 Mary Scott in her butterfly costume and Jane Sheriff, Little Red Riding hood try on their costumes designed by Mrs. Bob Carson, center, who has forty more to go. 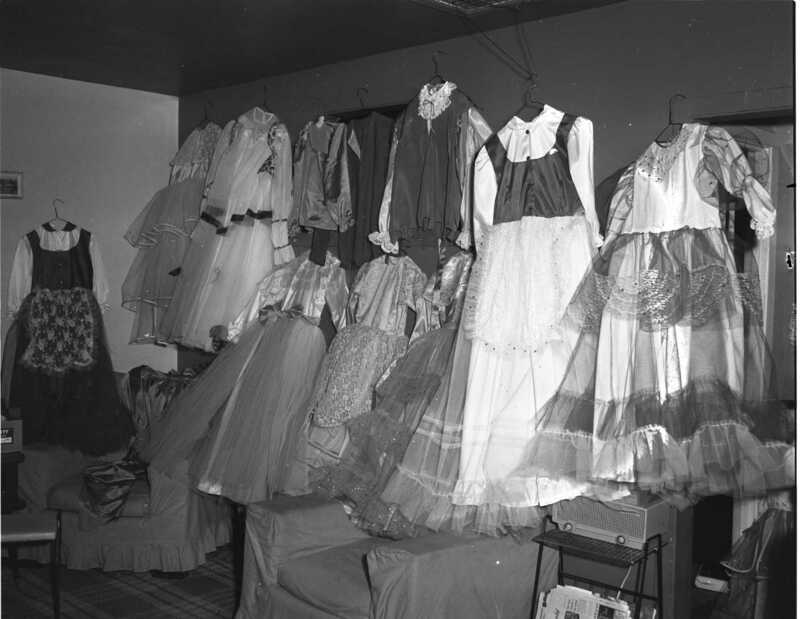 Some of the more than fifty dresses designed by Mrs. Bob Carson and sewn by Mrs. Ed MacDonald for the Santa Claus parade. Following in the footsteps of her brother Winston, a frequent oratorical contest winner, Susan Schell placed well up in the Simcoe County weed essay contest sponsored by county council this fall. 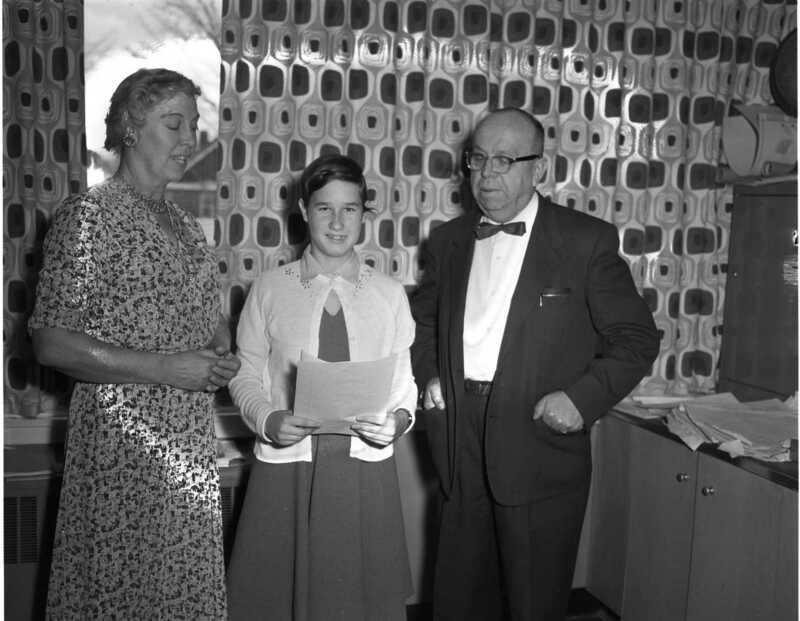 Daughter of Mr. & Mrs. Norman Schell, Susan is seen with her teacher Miss Margaret Duffett and Morgan Lewis, principal of Regent Public School. Every member of Miss Duffett’s grade six class submitted essays. Seven new members were added to the Penetang Legion Monday, November 25th. 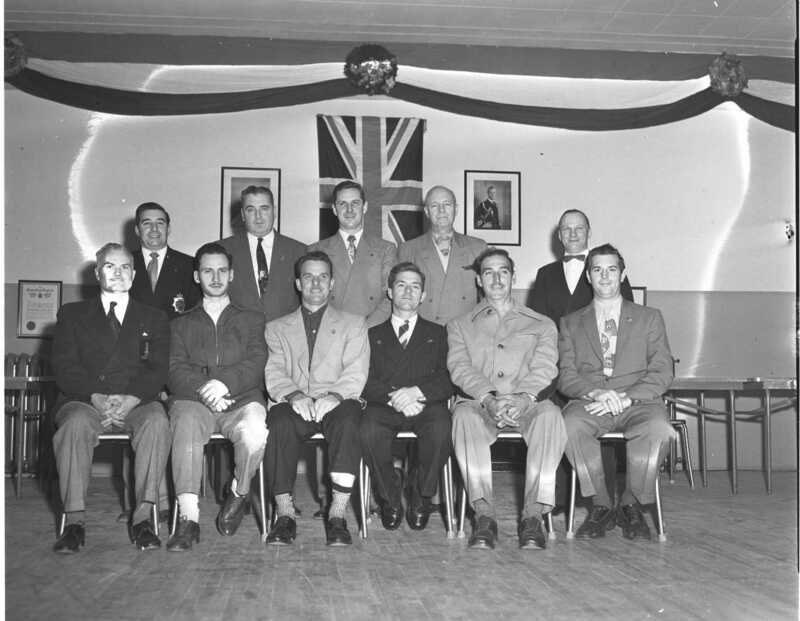 They are shown here with the installing officers standing behind. Seated, Ken MacDonald, Earl Vivian, Jerry Quesnelle, Phil Lacroix, Edmond Leduc and Omer Ladoucer. Carson Rae was absent when the photo was taken. Standing, Larry Desjardins, George Scott, Wilkie Garraway, John Houston and Julien Gignac. 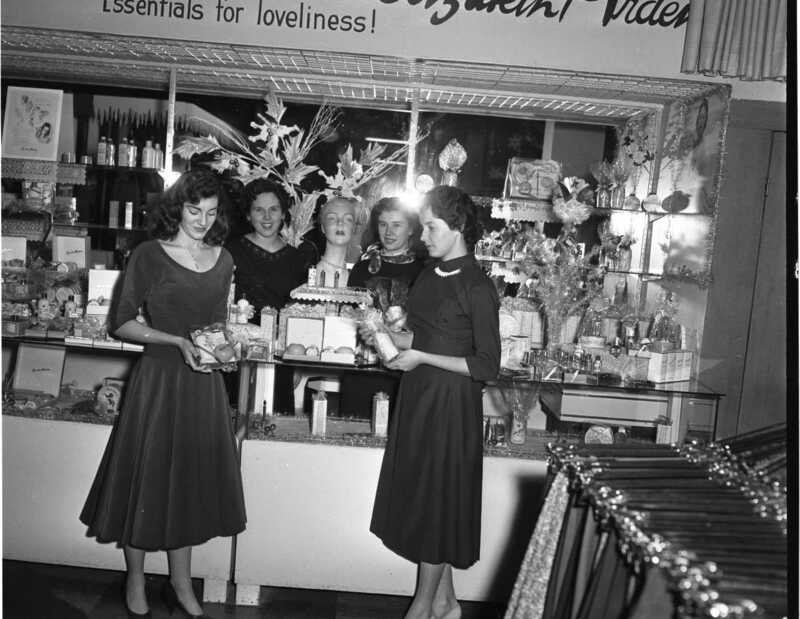 Marianne Wheeler and Honalore Schmid pass a covetous eye over toiletries during teenagers day at Edward’s Specialty Shoppe Saturday afternoon. Girls in the back are Dorothy Prescott and Ann Shaw. Teenagers had a gay time for themselves at Edward’s Specialty Shoppe Saturday afternoon. The special event just for teens included modelling clothes, costume jewellery and toiletries, complete with coffee and cokes. 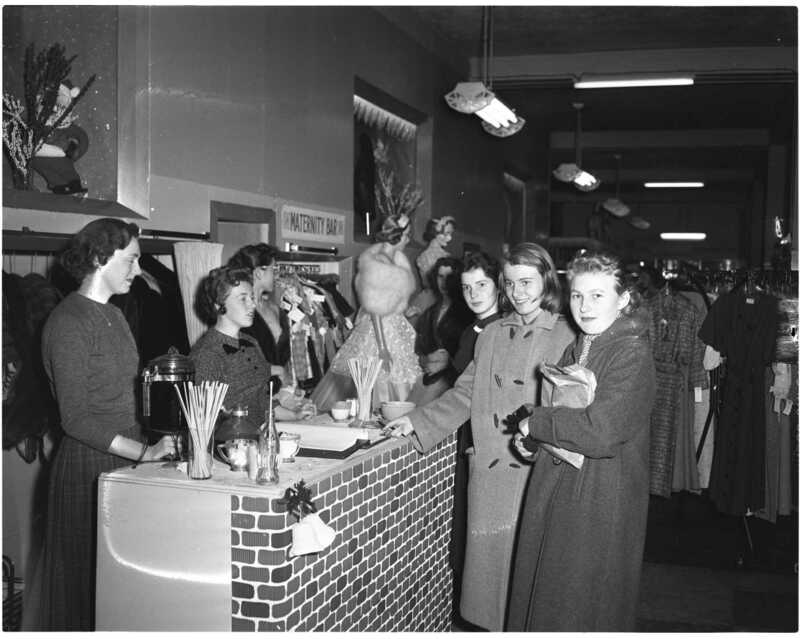 In charge of the beverage counter is Doris Wainman and Dianne Willock. 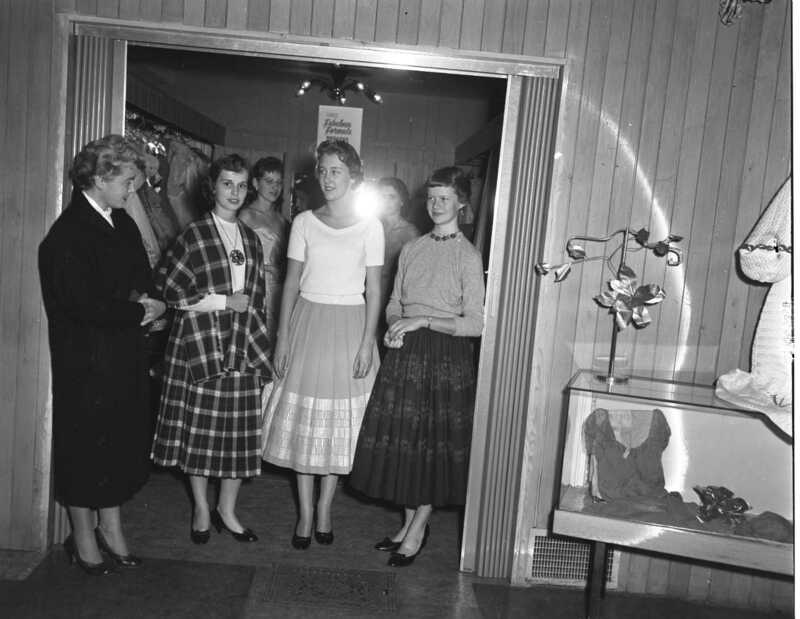 Mrs. David Markgraf passes an approving eye over costumes worn by Stephanie Shaw, Joanne Christie and Betty Trace. The girls modelled the clothes at Edward’s coke and coffee party Saturday afternoon in Elmvale. Every year at this time, members of Midland Junior Chamber of Commerce put up Christmas decorations on light standards along King Street. 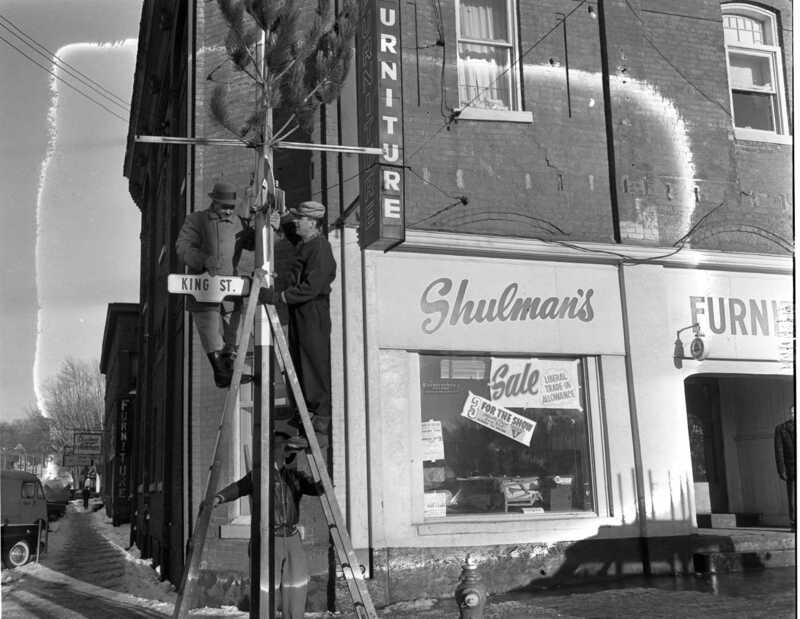 Bill Spiker, left, and Johnny Gianetto place two of the wooden candy canes on a pole at King and Bay Streets. Wary of falling pliers, Herman Livingston holds the ladder. 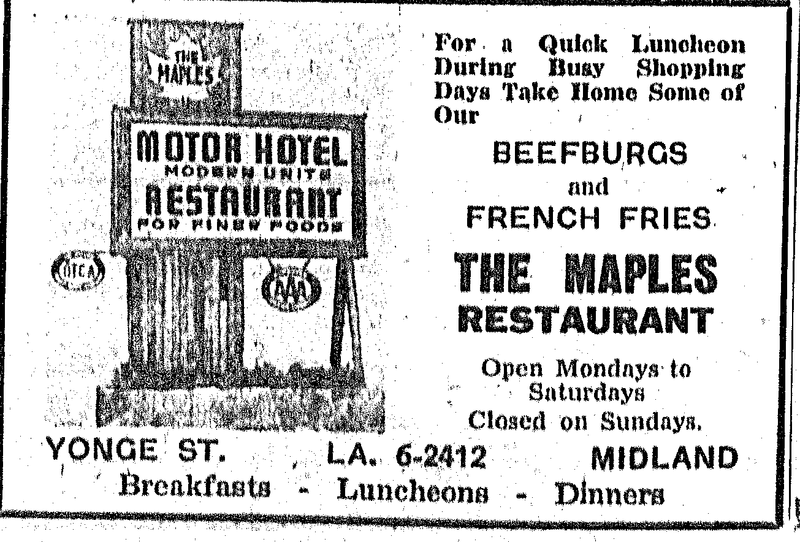 The Midland Free Press headline of December 4, 1957. Firm to Build New Plant – Cost Tops $1,000,000.00. Pillsbury Canada Limited is building a new plant in Midland at a cost of more than $1,000,000. Executive Vice-president William H. Pinchin announced today. The modern 35,000 square foot structure will house lines for the production of cake mixes and refrigerated fresh dough products. It will be built adjacent to the company’s Midland flour mill. 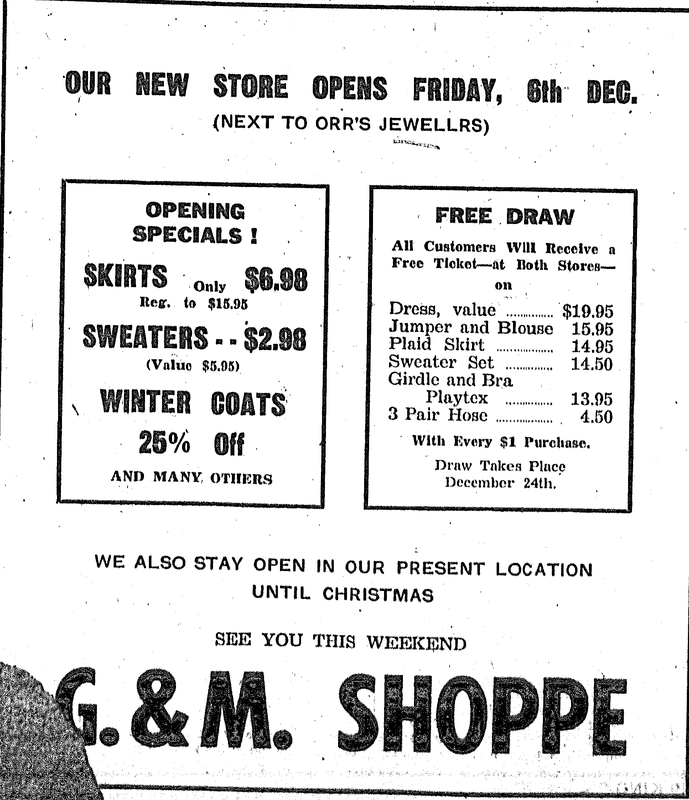 The County Herald headline of December 10, 1957. Forecast Boom at Port in Housing & Industry. An unmistakable feeling of optimism hung over the municipal offices in Port McNicoll Wednesday night, despite a rather disappointing turnout for the annual nominations. It wasn’t hard to gather, however, that Reeve Albert Calvert and other members of council feel the year 1958 will be an important one in the village’s history. “I feel next year will be a turning point,” said C. N. Larkin, operator of a small manufacturing plant in Port and seeking re-election to the council for 1958. 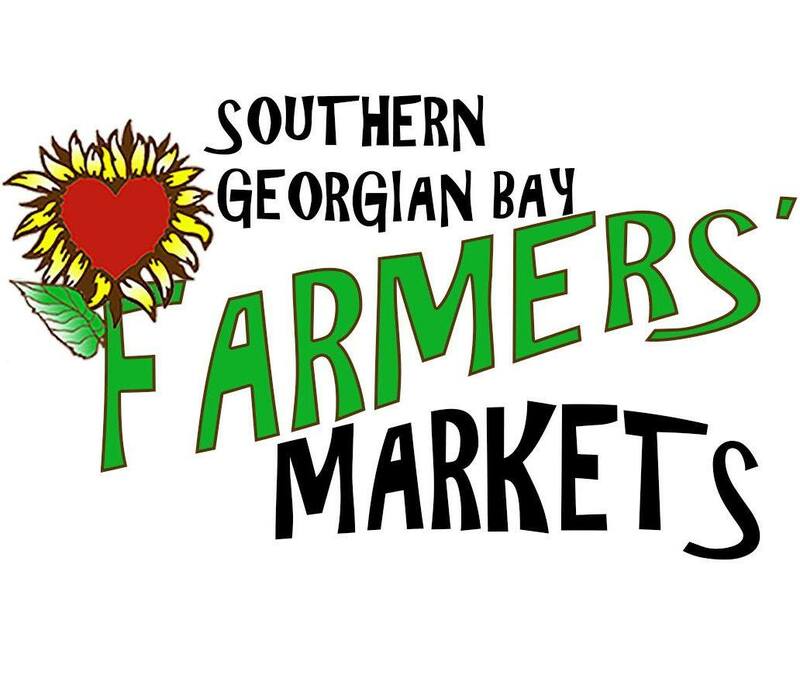 Reeve Calvert said the village had excellent hopes of obtaining three new small industries and one larger one. Reason for the optimism is based on the proposed new low-cost housing sub-division to be built in the northwest corner of the village, by the Meadows Company. Unless persons using, or who have used the services of St. Andrews Hospital accept the responsibility of paying their bills, they will shortly have no hospital. This was the blunt statement by Chairman R. J. Pinchin during last week’s meeting of the St. Andrews board. Non-payment of accounts left the hospital “no alternative” to the raising of rates, recommended by the Ontario Hospital Commission and reported earlier in this paper, Mr. Pinchin said. Financial statement of the hospital, as of Oct. 31, showed a staggering total of $103,266 in accounts receivable. It’s not only the toy makers who are capitalizing on Sputnik. Shoe Corporation of Canada announces that the Hewetson factory at Brampton has introduced a new line of strato shoes. And, in keeping with the Christmas season and the Intercontinental influence, the first strato style has been christened “the missile toe”. 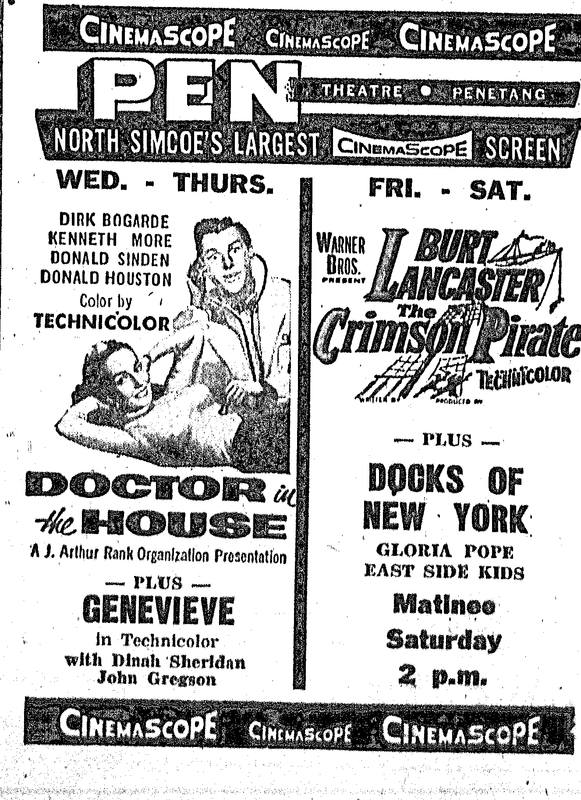 Future citizens of Midland, who may at some time have cause to open the copper box contained in the cornerstone of the new municipal building, should have a fair idea what life was like in the town in 1957. Contents contained in the box were as follows: Copy of construction by law of Midland’s first town hall; copy of construction bylaw and Ontario Municipal Board’s order re the new building; portrait of the 1956 council; portrait of 1957 council; copy of Nov. 27th edition of the Free Press Herald; records regarding Caledonian Lodge; records regarding YMCA and Y’s Men’s Club; records regarding the Midland Lion’s Club; picture of present members of Kiwanis Club; Souvenir year book, Midland-Penetanguishene High School, 1956 – 1957; souvenir program of the opening of the new building. Nearly 50 Midland-Penetang High School students will participate as actors or stage crews in the school’s inter-house drama festival to be held in MPDHS auditorium Friday night. All four houses—Alpha, Theta, Sigma and Delta—will present plays. Under the direction of Mrs. Tait and Mr. Moffat, House Alpha will present “Rich Man, Poor Man,” from House Theta will come “The Monkey’s Paw,” directed by Mr. Thompson. Sigma’s entry, “Brothers in Arms,” will be directed by Miss Kincaide and Mr. Elliott, “Quiet Please” will be directed by Miss H. Moderwell and Mr. Hanna and will be presented by Delta House. 25 Years Ago This Week 1932 – Two county councillors, Councillor Cunningham of Alliston and Councillor Brandon of Tottenham, submitted a proposal to the November session calling for changes in the council’s constitution. Among their recommendations, was the one suggesting that representation on the council be reduced to the reeve of each municipality. It was felt that this cut in members and other recommendations they made would pare the costs of county council 50 percent. * * * The Holland House, a summer hotel at Waubaushene, was destroyed by fire which broke out about 3 a.m. The owners of the building were in Toronto at the time. Midland fire brigade was called to help keep the flames from spreading to other buildings. * * * East Simcoe Liberals, at a meeting in Midland’s Capitol Theatre, mustered their forces for the forthcoming federal election. J. T. Payette was re-elected president and Wm. A. Robinson was returned as secretary * * * Coldwater dog owners were up in arms over an epidemic of dog poisonings which had occurred in the village. * * * A report from Berlin, Germany, indicated that a post office official in that city was suing his wife for divorce because of her “excessive and inconsiderate cigar-smoking.” * * * Honey Harbour permanent and summer residents had requested the Ontario Hydro to construct power transmission lines into the area. The power could be brought in from Port Severn, the group suggested. Faced with a $17,000 deficit, Victoria Harbour council has announced it will impose a one percent compound interest penalty on all tax arrears, effective Jan. 1, 1958. The decision was taken at a special meeting of the council Nov. 29 and was contained in a motion submitted by Councillors Theo Bernard and W. A. Savage. Chief of the Ontario Department of Lands and Forests lands division at head office, A. S. Bray, son of Mr. and Mrs. M. J. Bray, Midland, has been appointed regional director over the northwestern section of the province. He will be stationed at Port Arthur. C.N. Larkin was my grandfather and I guess that makes us related. I would love to hear from you sometime. Is there a way we can get in contact without posting our numbers?